This drawing covers the coastal area of Burnham on Sea. 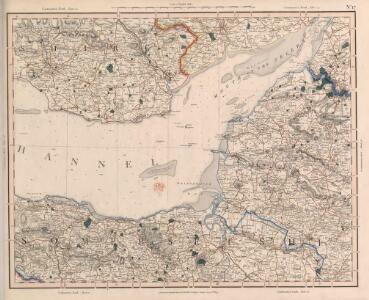 A careful study has been made of the coastline, noting sand banks and low watermarks and a lighthouse at Burnham. Faint pencil lines radiate from a mark near Westonzoyland. This shows the point from which angular measurements were taken to plot topographical features. The drawing is unfinished, roads and settlements in the lower half being left unnamed. Attention given to the accurate delineation of the road network sets these maps apart from earlier county plans and is a further reflection of the serious military emphasis of the Survey as a whole. This drawing covers the Mendip Hills, from Wrington to Wells. Pencil rays extend from the left of the map towards Red Hill, on the right, and Mark and Tillham, on the bottom right. The draughtsman used these lines to measure relative distance and to plot locations by triangulation. Masberry Castle is shown in the bottom right, on top of a hill whose steepness is indicated by soft brushwork interlining ('hachuring'). The castle path joins the main turnpike road, whose length is annotated at intervals of one mile. Many field boundaries are marked in red, denoting stone walls rather than corrections in this case. 1 : 21120 This drawing covers part of Somerset. The narrow ridge of the Quantock Hills, depicted on the left by brushwork interlining, runs north west from Taunton Deane Vale for 19km to the Bristol Channel coast. At the top of the sheet, white rocks are indicated along the coastline of Bridgewater Bay. Woodland, heathland, formal parkland and arable land are distinguished by symbols.